Garlic is a perennial vegetable plant which is a must-have in the vegetable patch. It craves sun. Its bulbs are used in cooking, where they are used for their taste and spicing abilities. First of all, purchase strands of garlic that are certified nematode (roundworm) and virus-free. 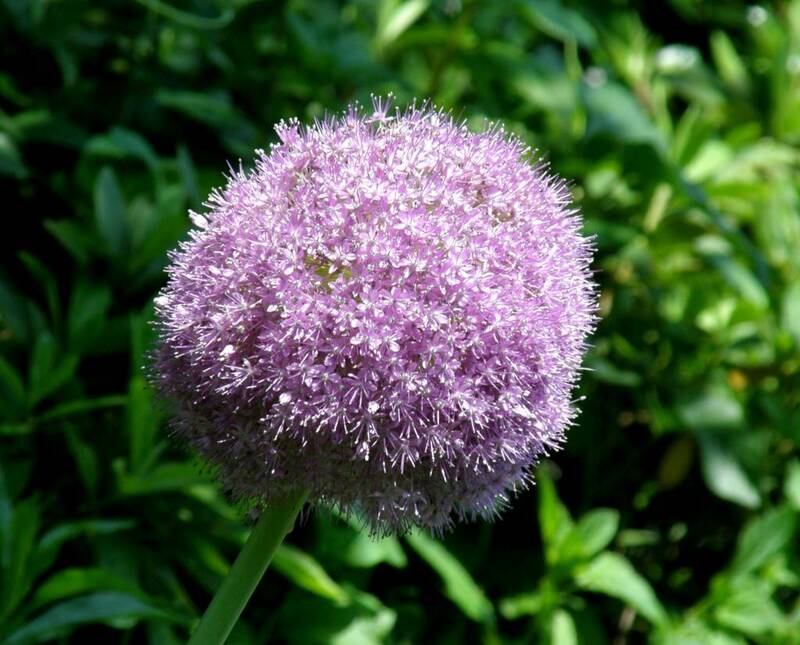 Traditionally, white and purple garlic is planted in fall and pink garlic is planted at the very beginning of spring. 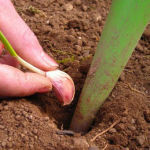 It is best to plant cloves (small secondary bulbs) in fall (October-November) if your soil is well drained, otherwise wait for the beginning of spring. For areas with rather mild climates, you can even start planting your cloves early January or February. For climates that are a bit harsher, white garlic is planted in fall. For climates that are a milder, purple garlic is planted in fall. 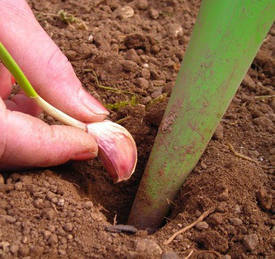 Pink garlic is planted at the end of winter in climates that are mild, and at the beginning of spring in other areas. Pink garlic is an early variety that can be harvested in spring. When selecting the cloves, plant those that are around the outside instead of the inside ones because they are larger and more hardy. You can use store-bought cloves intended for cooking, if the label says they are virus-free. Start with digging one or more furrows an inch (a couple centimeters) deep. Place furrows at a distance of around 8 inches (20 cm). Place the cloves an inch (a couple centimeters) deep, with the pointed tip facing upwards. Set the cloves at least 12 inches (10 cm) apart to give them space to grow. Cover with light soil and then water regularly. Garlic requires a lot of sunlight. Be careful! Garlic doesn’t like waterlogged soil. If this is the case, amend your soil with sand. Garlic is quite easy to care for and requires very little care as it grows. The following best practices will help you have a better harvest, though. When the young plants start growing out of the soil, clean around them on a regular basis to remove weeds, and help water penetrate the ground in that you break up the soil crust. Water in summer when hot or in case of dry spells. 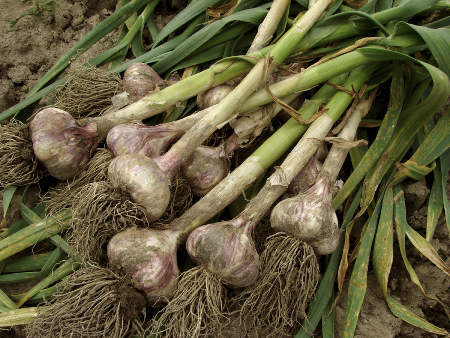 Garlic hates excess water, so never drown the bulbs. Hoe the rows and remove weeds as they appear. First leaves appear around 1 month after sowing. 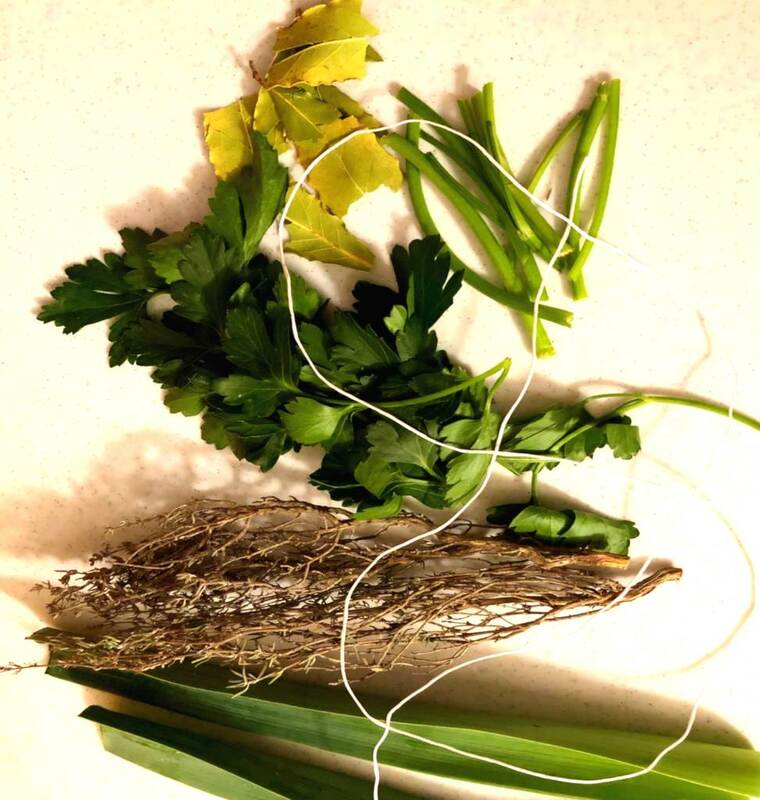 Before harvesting, remember to tie up stems that are beginning to turn yellow, to keep them from growing and to force the sap to gather in the head of garlic. Harvest in summer, generally June-July. Before stowing the garlic away, dry it off in the sun for a few days. After that, clean it and keep it in a dry, ventilated and rather cool spot. 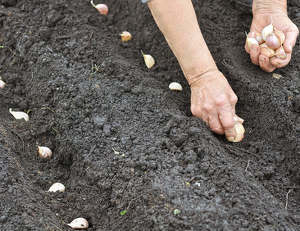 When bulbs reach an honorable size and seem to be well-formed (June to July depending on the chosen variety), that is the time to harvest your garlic! Note that it is also possible to harvest garlic in spring while still green, usually in May, and to eat the bulbs and leaves alike. Garlic LOVES growing together with red beets, chamomile, carrots, celery, strawberry plants, lettuce, leek and tomatoes. Garlic DREADS sharing space with asparagus, cabbages, broad beans, beans and peas. Native to Central Asia, garlic is a condiment with long, flat leaves that shoot up from the base and produces white to light pink flowers. It has been used for millennia to spice up dishes in most parts of the world. It has a capacity to add taste to many dishes, and it has been proven to have antiseptic, stimulating and even aphrodisiac properties, nothing less! 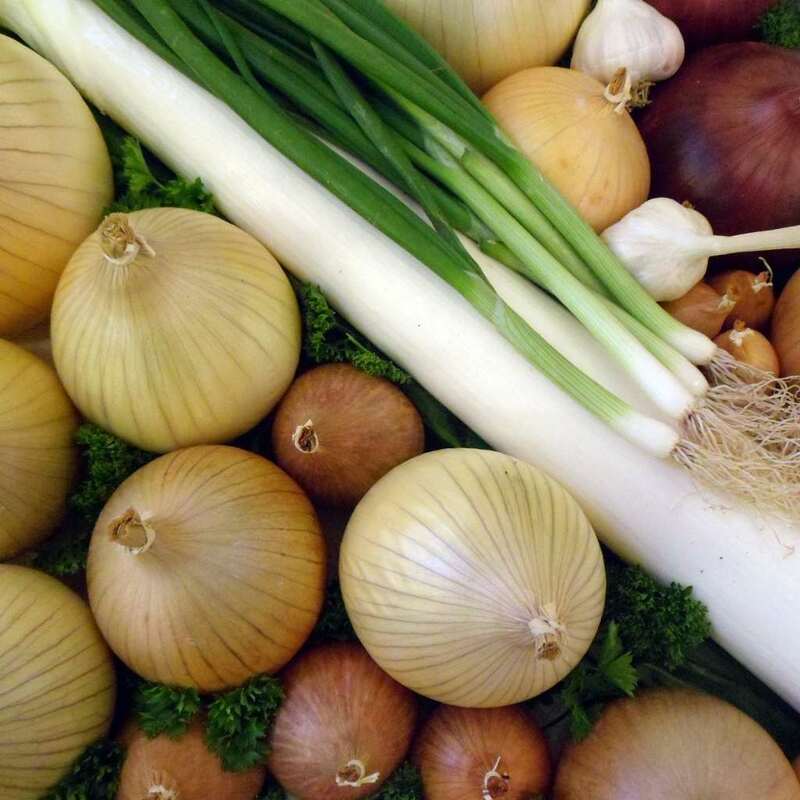 Garlic is part of the same family as shallots, leek and onions. Garlic has many health benefits and therapeutic properties and it has been used for a long time to cure many ailments. Indeed, garlic is both tonic and antiseptic, it helps fight hypertension and rheumatism. It also is an ally in fighting certain garden diseases such as peach leaf curl, either by planting it nearby or used in a garlic decoction. In spring, remove weeds around garlic because being crowded really slows its growth.